The Oklahoma City Thunder kicked off its 10th season October 19th against the New York Knicks last week, beating New York 105-84, and with new recruits Carmelo Anthony and Paul George. The tone Anthony and George set has made fans believe OKC can go all the way this year. “If it goes like it did tonight, I think they can make it to the second or third round,” said Diane Rogers. Rogers said she looks forward to seeing OKC play against Houston again. She’s nervous about playing against Golden State, but knows that’s the game everyone is going to watch. Standing outside the area were Randy Duckworth and Doug Hacking and they said they were believers. Hacking said he looks forward to seeing Houston and Golden State again. “Russell didn’t even break a sweat doing a triple double,” he said. 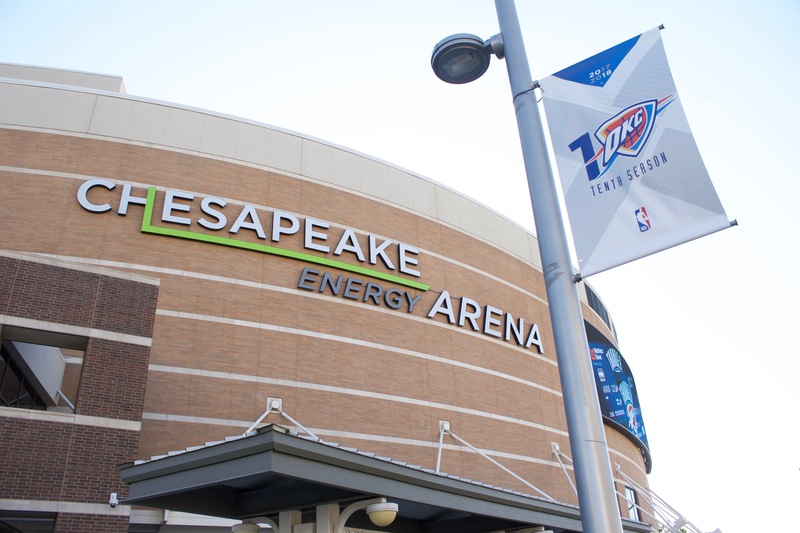 Oklahoma City is welcoming the Thunder’s 10th season with signs all around the area. Photo by Natalie Nell. Since it was opening night and the start of OKC’s 10th season, the celebration for the fans was a special one. On every seat of the arena, were blue t-shirts with 405 in the center of it. The number 10 was highlighted in between the 4 and the 0, accenting this anticipated season. Free t-shirts on every seat is usually a playoff tradition. Diana Heusel also liked the celebration and was excited about the crowd that night. Standing alongside other police officers outside the arena was Oklahoma City Sergeant Cody Koelsch. He, too, is confident about the Thunder going to the championship. “I think it’s our best chance this year,” he said. Koelsch says he always enjoys seeing center Steven Adams and forward Nick Collison play. Before the start of the season, there were many changes that have made Oklahoma City a unique and diverse team in the NBA this season. In July, the Indiana Pacers traded forward Paul George to OKC. In September, the New York Knicks traded forward Carmelo Anthony as well. Last month, reigning MVP Russell Westbrook signed a five-year $205 million contract extension, making it the biggest total contract in NBA history. Westbrook staying has given Oklahoma City and the state much pride and hope. “Zero is my hero,” Rogers said. The same day Westbrook signed, Mayor of Oklahoma City Mick Cornett signed a proclamation, officially declaring every day from then on, as Russell Westbrook Day. Westbrook said there is no place he would rather be than in OKC. Westbrooks’s motto, “Why Not?”, is a growing phenomenon as it encourages people to believe in themselves. The emergence of Westbrook, Anthony, and George has made them become known as the “Big 3” and a trio to watch out for in the NBA. All three have something in common: they have never won an NBA championship. Despite each of them having a long and rewarding career, they hope this year they’ll be able to do that. After the Knicks game, head coach Billy Donovan praised how their defense has been improving since the start of training camp. “By playing great defense, especially this early in this season where probably most teams are trying to find their way, it gives you at least a little bit of room where if you don’t have a great offensive night you can really fall back on your defense,” Donovan said. George was surprised by the atmosphere of the Thunder game. OKC played the Minnesota Timberwolves last Sunday and lost 113-115, by a buzzer-beater. It was a tight game, and Anthony said it was a matter of who was going to finish on top. Westbrook said he sees some “sparks” on this team and that they can perform at a high level, but they just got to do it for forty eight minutes. Wednesday night OKC played Indiana, and won 114-96. Their record is now 2-2.